Utilize the cantilever jib for maneuvering objects over a work cell or to help elevate materials for palletizing. Straddle arms are secured to the floor, providing stability for the cantilever. 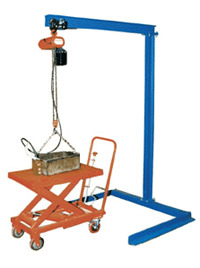 Hoist and trolly available (see Hoists. Units are power coated royal blue. Capacities are 300, 600, 1000 & 2000lbs. Under I-Beam to Ground 84"
Base Inner Straddle Width 48"